This page is for parents to find support and advice on a number of topics and download useful leaflets. Please contact us to let us know if there is anything else you would like to see included on this page. Please see our Links page for links to useful websites. 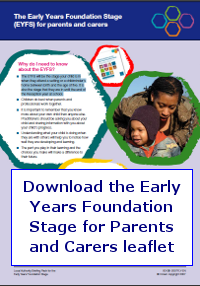 The Early Years Foundation Stage is a stage of children’s development from birth to the end of their first, (Reception), year in school.